The amount and type of available data have drastically increased through digitization. This growth in digital data has given rise to opportunities for automated content assessment to quickly build an understanding of opinions and trends contained in text data. Opinion Mining is a technology that can automatically comprehend textual data, thereby classifying statements as positive, negative or neutral and detecting the targets of those statements. Automated Opinion Mining relies on several Artificial Intelligence techniques such as Machine Learning and state-of-the-art Neural Networks (Deep Learning). These techniques allow for the automated discovery of the sentiments and the strategic knowledge contained within financial news. Natural Language Processing (NLP), which is the field from AI concerned with the processing of human language and the development of Human Language Technology (HLT), offers the possibility to track the mood of the public about a particular company or topic, influenced by published media information. With the continuously changing financial markets and the millions of financial news articles circulating daily, Augmented Language Intelligence can be applied to identify emotional states in texts and precisely quantify the mood of the financial market for a specific index or company on the basis of a large amount of news data analyzed. What happens in the Green Box? The algorithm identifies which entities are being talked about in the text, which events or situations those entities are involved in and which role those entities play in the particular event or situation, e.g. whether they perform some action (agent), are affected by it (patient), or are the cause of it (causer). With this information, the algorithm can later decide whether those entities behave as the targets of some sentiment statement. The sentiment analysis detects, for each meaningful part of a sentence (a clause), whether this is positive, negative or neutral. It also detects the entity the sentiment is about (target). The different sentiments about each unique target are aggregated at the sentence and article levels, providing an overall view of the sentiment towards the particular entity. Real-time collection of financial & business news. Detection of contextual content going beyond a keyword analysis. 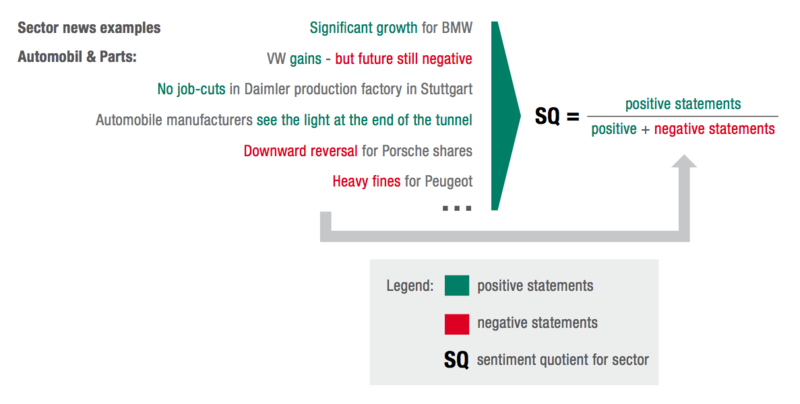 Evaluation in signal categories Positive – Negative – Neutral.